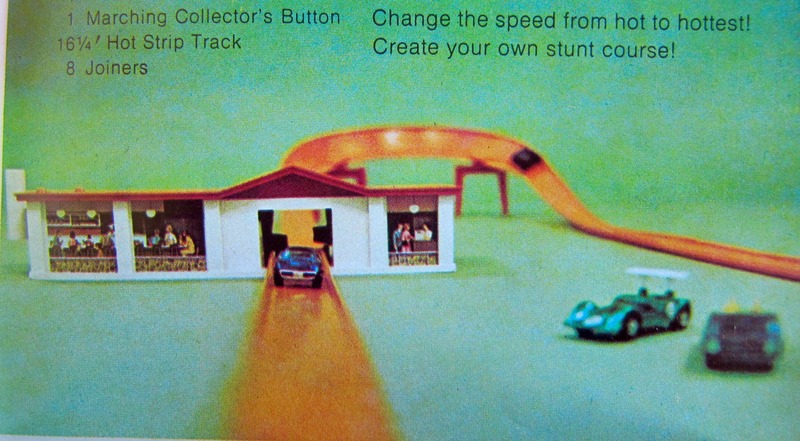 For 1969, Mattel commissioned a photo book of Hot Wheels in action for kids. Front Cover of The Fast Cars Book. The book only cost 29 cents. That was significantly cheaper than the price of a single Hot Wheels car. The book was published by Golden Press of New York. Jo Anne Wood did the writing and aimed it at young kids. But it’s the photography by Gerry Swart that stands out. 2017 edition of the 6 Lane Raceway. …the book starts with that layout. l to r: Ford J car, Custom Firebird, Splittin’ Image, Deora, red Hot Heap and aqua Hot Heap. Next, the book takes us into some curves. Ford J car in the curves. Splittin’ Image blasting through a full turn. Then we see some stunting. A Custom Camaro and Silhouette in the loop. 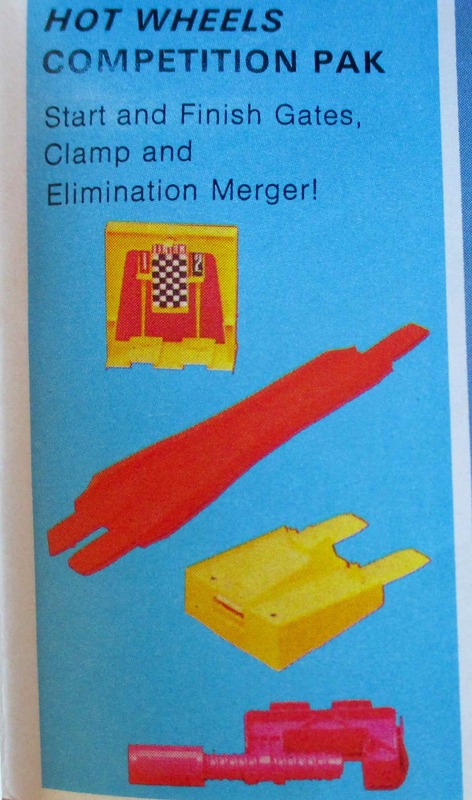 Here comes the 2 lane Drag Race Action Set from 1968. The Silhouette beats the Custom Camaro to the flag. The 1969 Action City play set is the backdrop for the next page. A red Hot Heap on an Action City road. 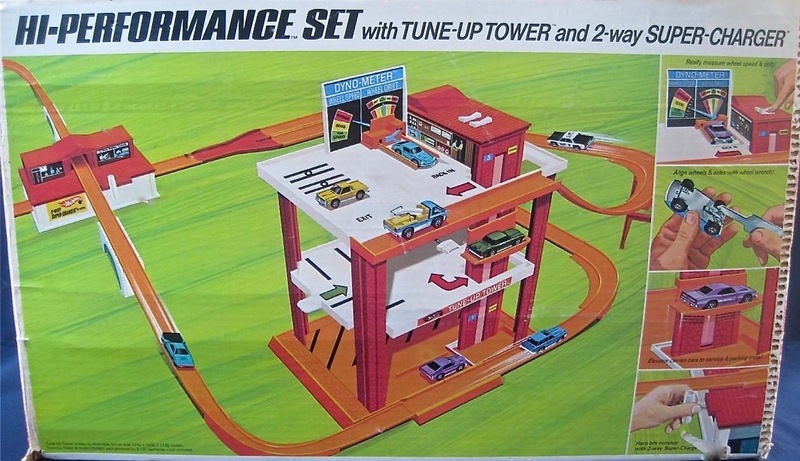 For the Service Station picture, this 1968 Pop Up play set gets used. Pop Up Service Station – front. Pop Up Service Station – back. A Custom Camaro getting full service treatment. Next up, the 1969 Talking Service Center. For some reason, the blue Splittin’ Image is travelling backwards down the top floor ramp of the Talking Service Center. Finishing up in Action City. Here’s my YouTube video of this book. Showing Hot Wheels are still fast. Still fun. 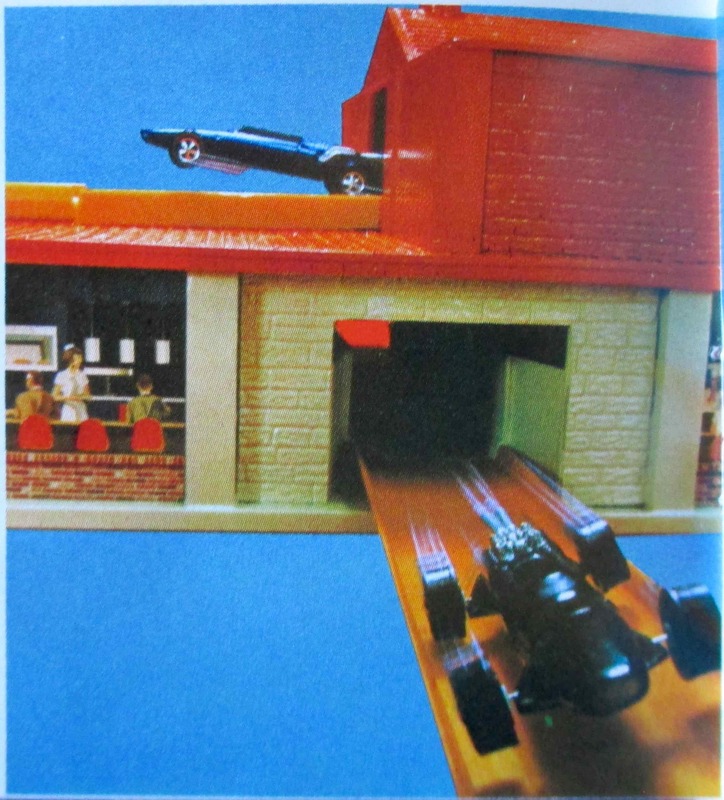 1969 Collectors’ Catalog picture of the Action City play set. Copyright Mattel, Inc. 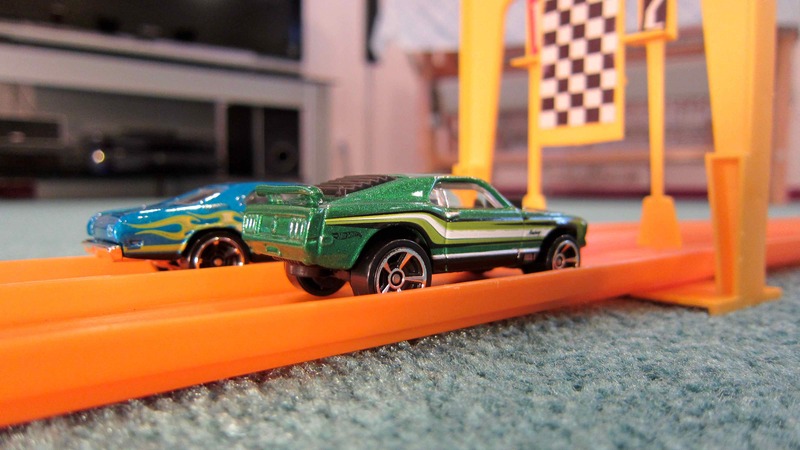 This is Hot Wheels’s biggest track set for 1969, the Super-Charger Grand Prix Race Set. Box art – front with included cars visible. Courtesy eBay. There are a lot of track pieces. Here’s the fully assembled race track. Time for some perspective. It’s 1969 and we are about to embark on “lap after lap” action. 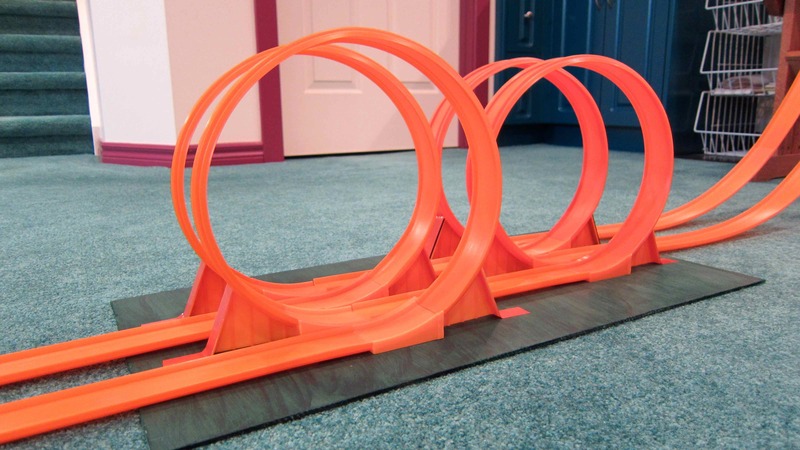 Just the year before, we experienced ground breaking gravity tracks from Hot Wheels first year of production. 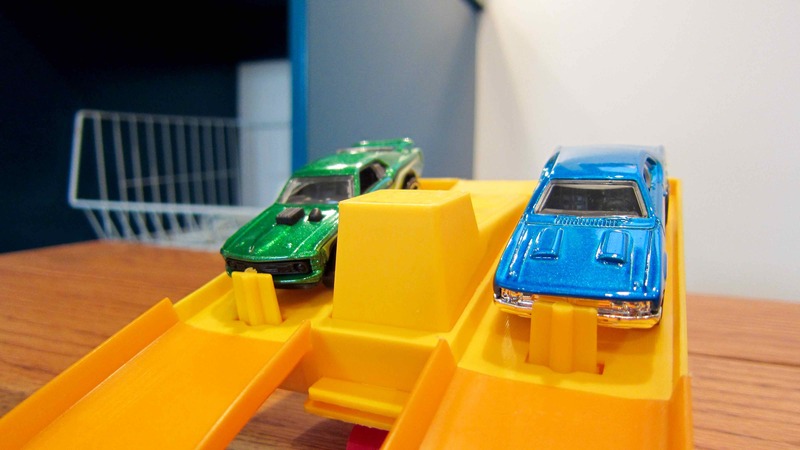 And, remember, the year before that we were pushing our Matchbox/Dinky/Corgi diecast cars around the floor by hand because there were no Hot Wheels. Now, in 1969, a massive one hundred lap race is at hand. The orange track is 44 feet long. There are 12 half curves measuring just over 1 foot each. That’s more than 56 total feet (17 meters) of track. One hundred laps means the cars will cover more than a mile (1.6 kilometres) together. From hand pushing diecast cars to mile running in just 2 years. Simply amazing! On this track today, I am putting a gold 2010 Ford Mustang GT with Faster Than Ever wheels up against a blue 1971 redline Six Shooter. New school vs old school. 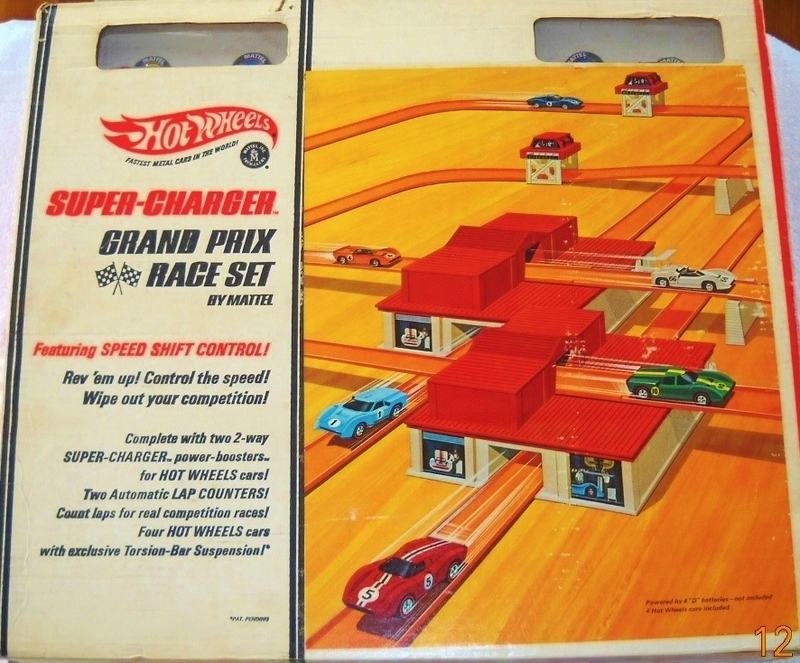 For more information on this track, check out my earlier review of the Super-Charger Grand Prix Race Set (part 1). 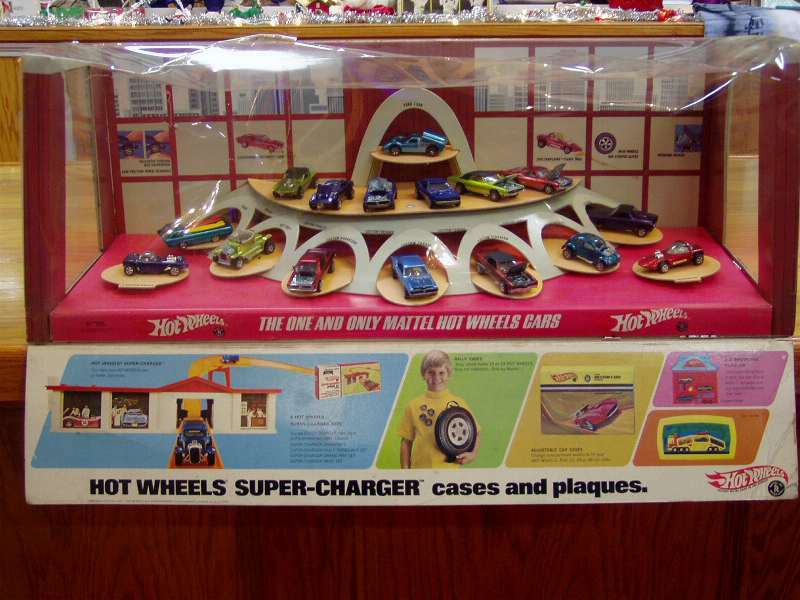 From 1968 to 1970 Mattel produced elaborate displays that were intended to showcase the Hot Wheels line-up for store customers. This late 1968 display looks like something right out of a big car show in Los Angeles or Detroit. Each of the “Sweet 16” cars is represented. Five of the cars have custom paint jobs just for this display. 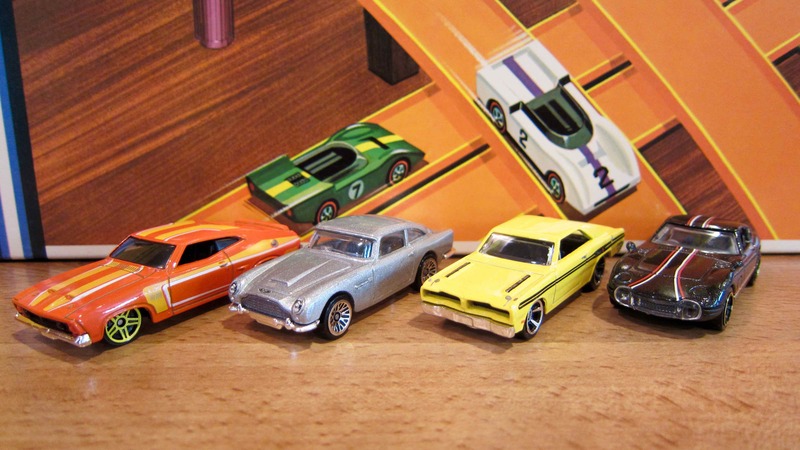 This includes a Watermelon Custom Mustang, Chocolate Brown Custom Camaro, Honey Gold Custom T-Bird, Light Blue Custom Cougar and the Ruby Red Custom Barracuda. For 1969 three displays are offered. 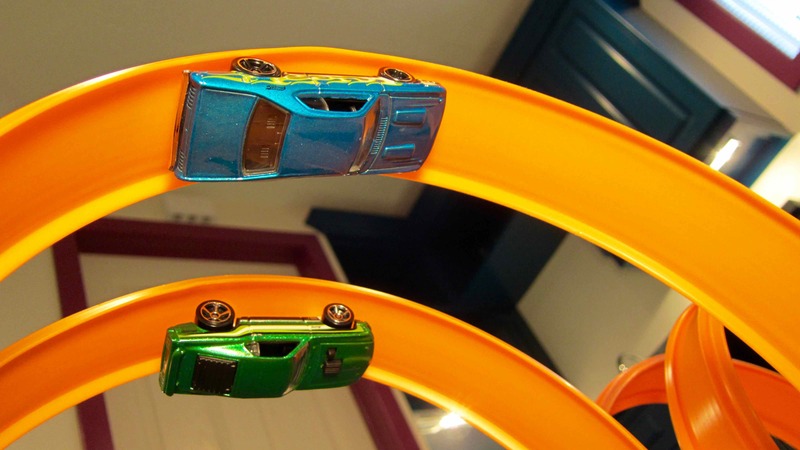 The first diorama shows Hot Wheels cars on a hilly coastal roadway crossing above cars that are travelling through a tunnel. The second display is located in Europe, possibly Monaco, where Grand Prix race cars are being paced at the race’s start by a Maserati Mistrel. Spectators have parked their European cars nearby. A ship at water’s edge is a nice touch. The third display puts us at the Daytona Motor Speedway where race cars are on the high banks of the track. In this case, spectators from a vintage car club have shown up presumably to cheer on the Classic ’57-Bird. The 1970 Display is a ‘Multi-Mural’ diorama with a white curved sloping track. The first three murals, from left to right, show a Spoiler style car, a heavyweight vehicle and a race car. The last mural on the right reveals the open road for Hot Wheels to travel on. 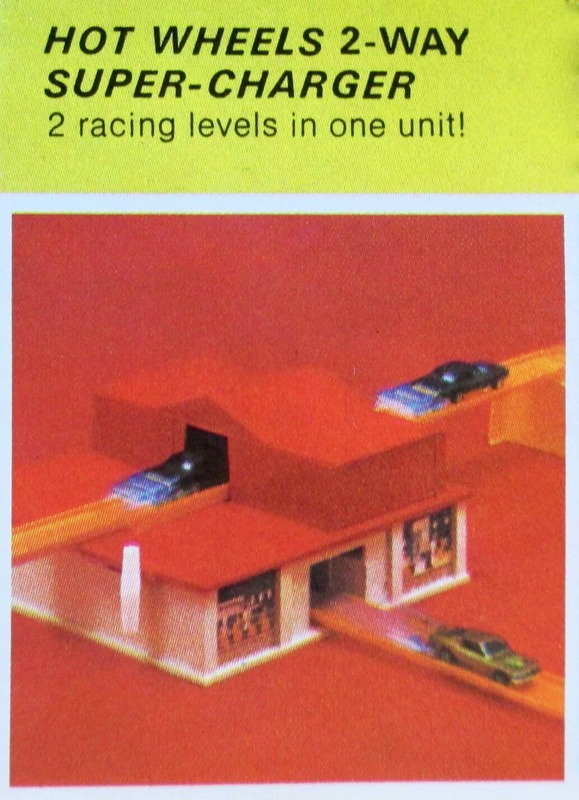 Also, for 1970, Hot Wheels was going ‘head-to-head’ with Matchbox so in England a special store display was used. 1970 U.K. display. Courtesy pinterest.com. So there you have it. 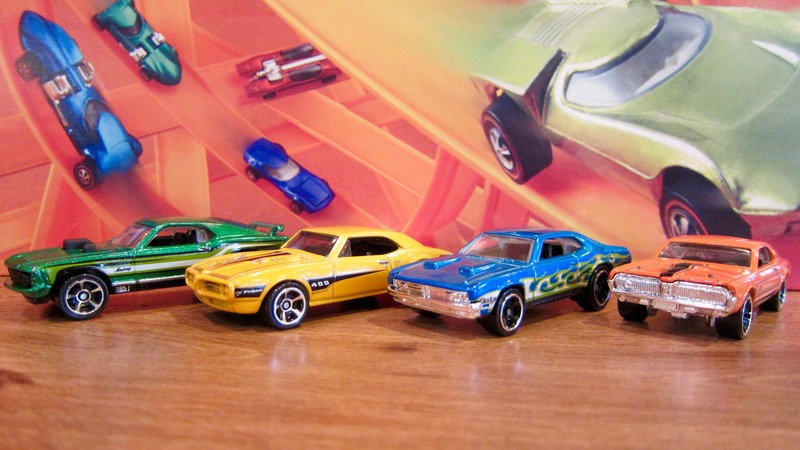 A look at some of the early Hot Wheels diorama displays used in stores. For more information you can check out http://redlinewheels.com and look under “articles”. 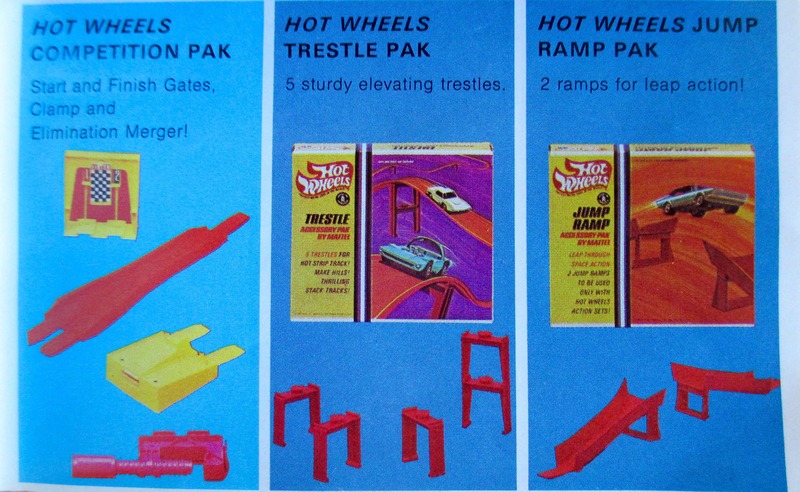 As a kid, the very first Hot Wheels accessory that I received was the Jump Ramp Pak. Box art – front. Copyright Mattel Inc.
And I loved it! 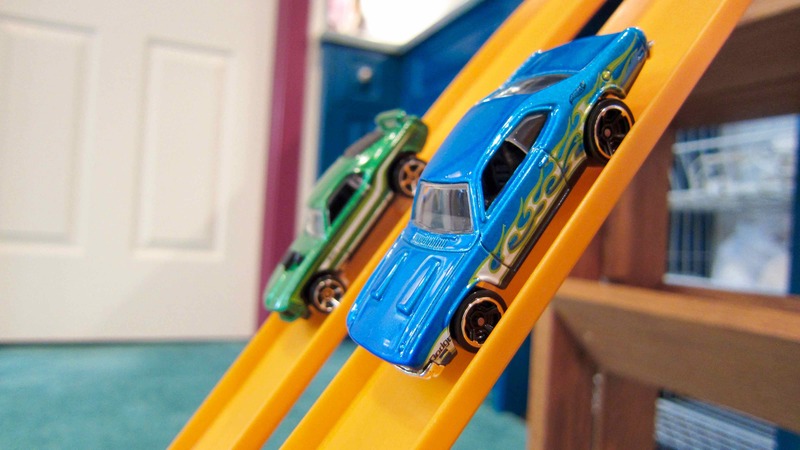 To see Hot Wheels catch big air, make a perfect landing and power down the rest of the track was too cool. Today I am making a custom track by putting 4 jump ramps together in one drag strip. Of the current crop of cars, I find that ’67 Camaros work very well on jumps. 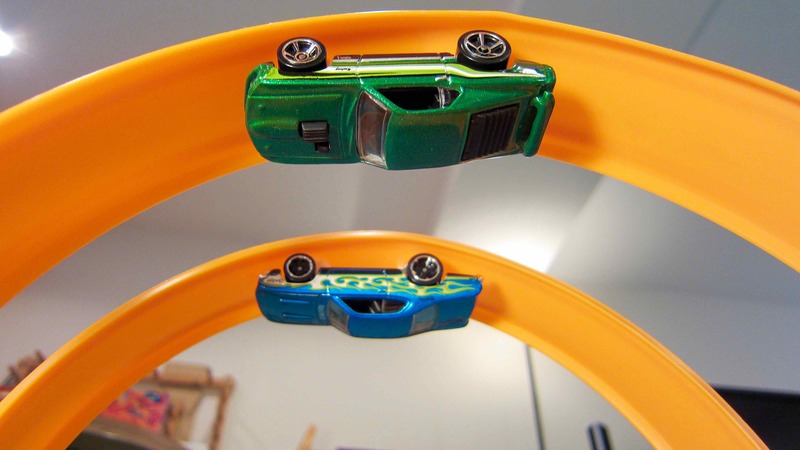 They roll quickly and their metal bodies on metal bases provide enough weight for the cars to sit down and stay on the track after taking a jump. Here are the 4 ’67 Camaros that I will be racing. from l to r: orange ’67 Camaro, green ’67 Camaro from the Mod Bod series, black ’67 Camaro and a yellow ’67 Camaro. And here’s the video of what happened on the track. So there you have it. 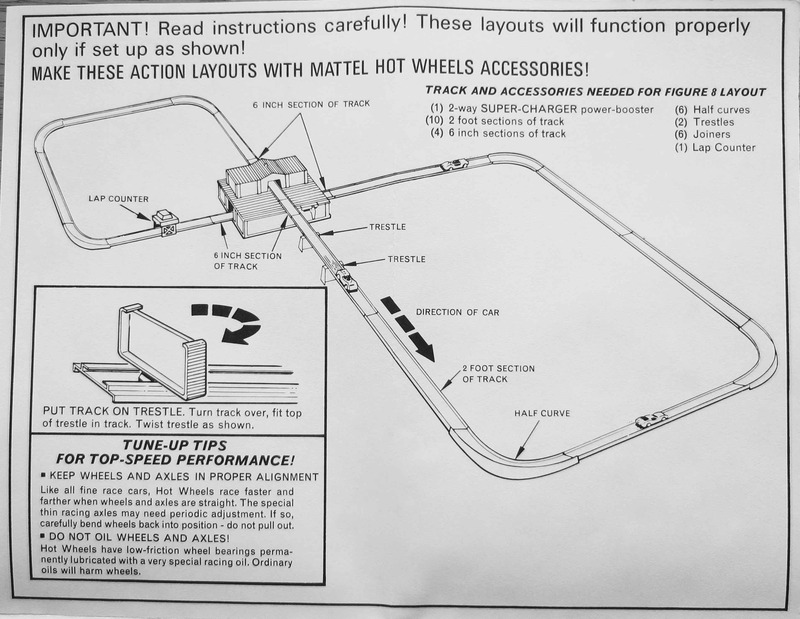 A custom track; The 1969 Hot Wheels Quad Jump Drag Strip. Close up of box art – front. Copyright Mattel, Inc. Box art – back. Copyright Mattel, Inc. Box art – side: Copyright Mattel, Inc. Box art – end. Copyright Mattel, Inc. Box art – other end. Copyright Mattel, Inc.
Italian version – front. Courtesy eBay. Italian version – back. Courtesy eBay. 1969 Collectors’ Catalogue. 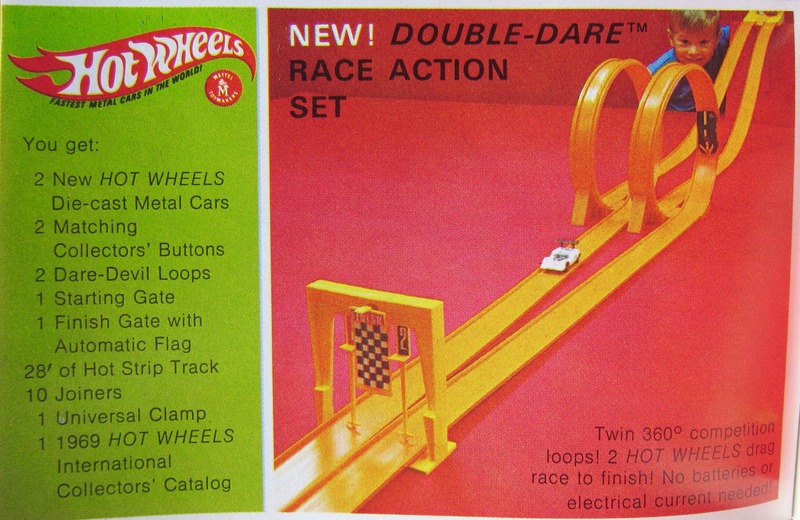 Copyright Mattel, Inc.
and I am adding another pair of loops to produce the Double-Double Drag Set. Here are the 4 cars that will take on this track. from l to r: a green ’70 Ford Mustang Mach 1, a yellow ’67 Pontiac Firebird 400, a blue ’71 Dodge Demon and an orange Mercury Cougar. Here’s a run down the track. Way up into the first pair of loops. Powering through the second set of loops. So there you have it. A custom track. 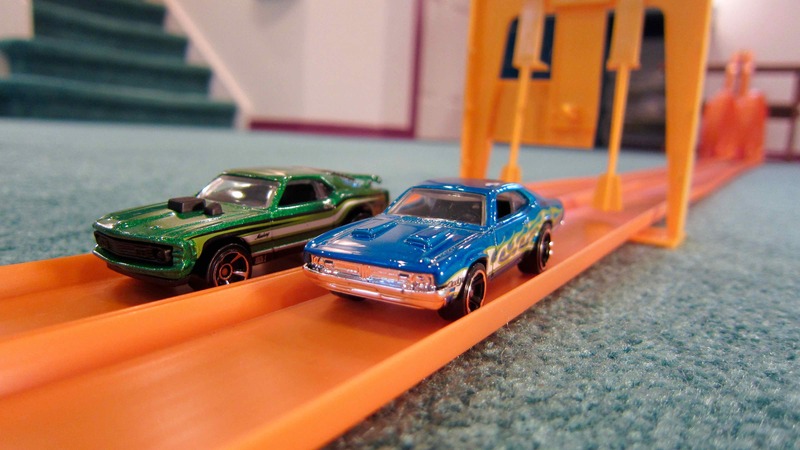 The 1969 Hot Wheels Double-Double Drag Set. 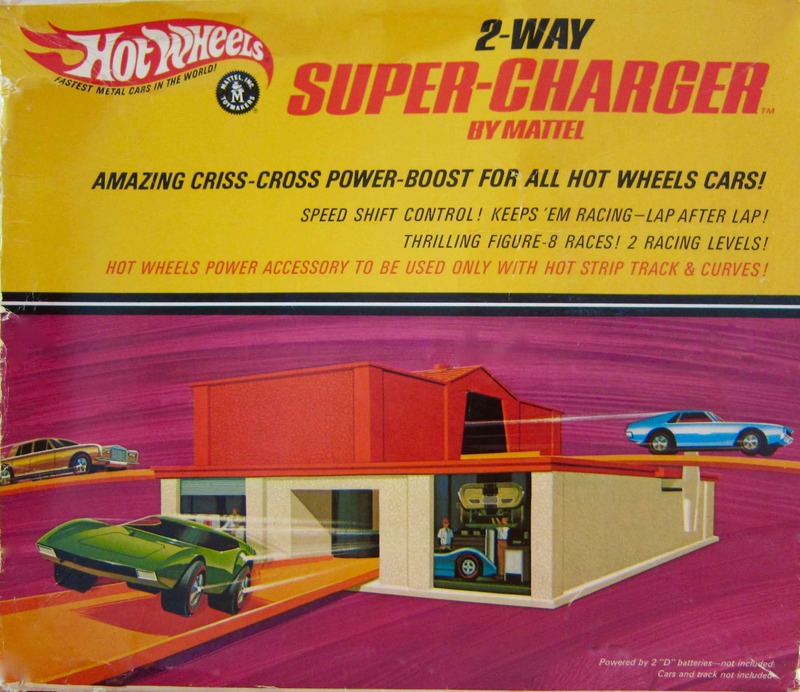 The 1969 Hot Wheels 2-Way Super-Charger. Instructions. Page 1. Copyright Mattel, Inc. Instructions. Page 2. Copyright Mattel, Inc. Instructions. Page 3. Copyright Mattel, Inc. Instructions. Page 4. Copyright Mattel, Inc. 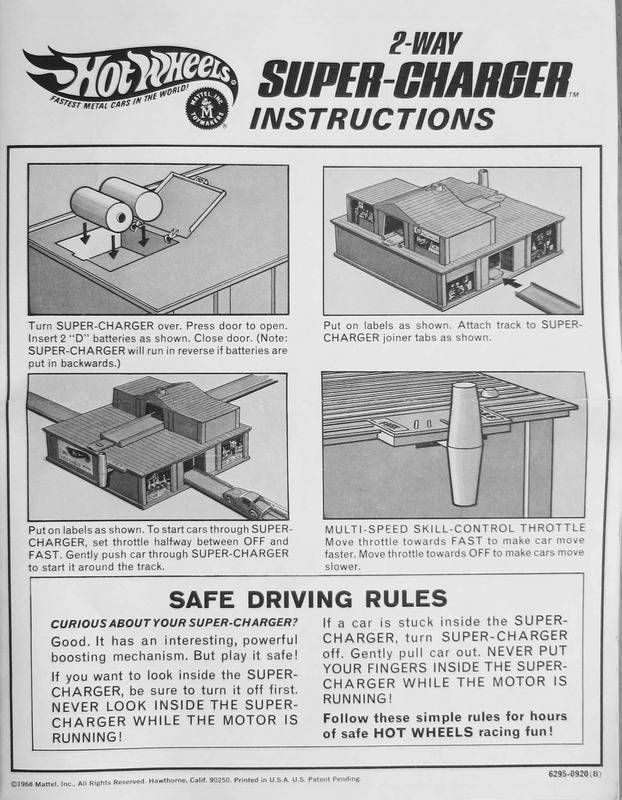 The standard Super-Charger typically goes with oval tracks. 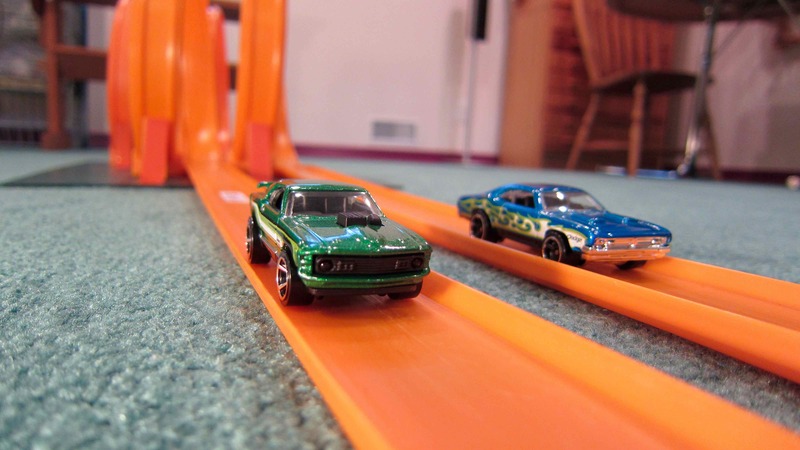 It’s pretty easy for a Hot Wheels car to run on a track with just 2 full curves. 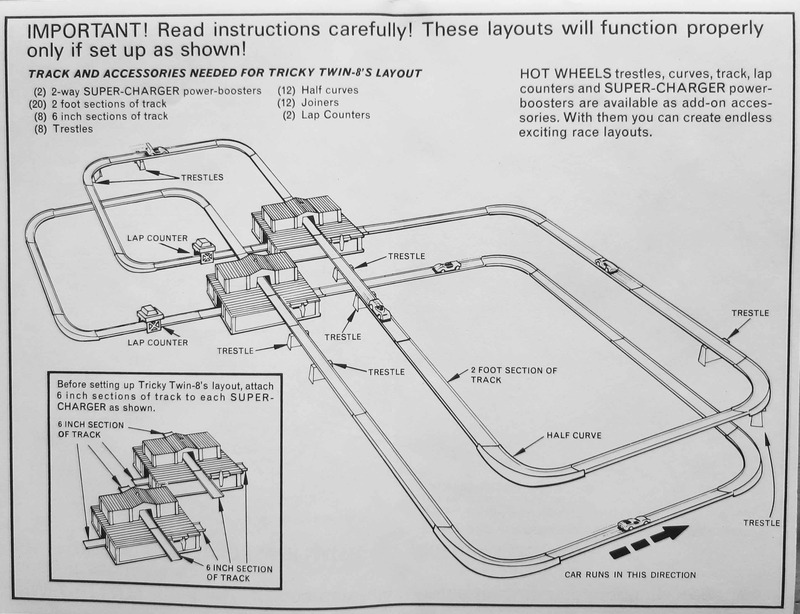 The 2-Way Super-Charger powers figure-8 layouts. 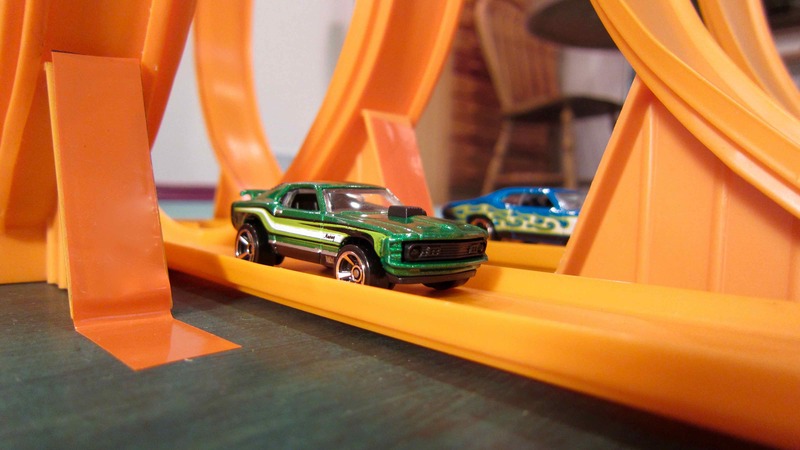 Figure-8 tracks are a lot harder for Hot Wheels cars to deal with because they have to negotiate 6 half curves on every lap. 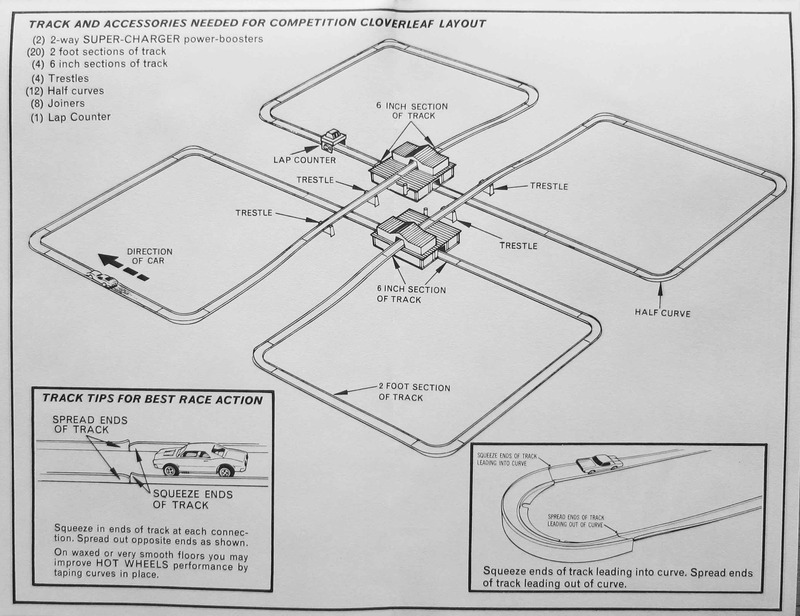 Appropriately, Mattel calls this figure-8 layout “The Tricky 8”. 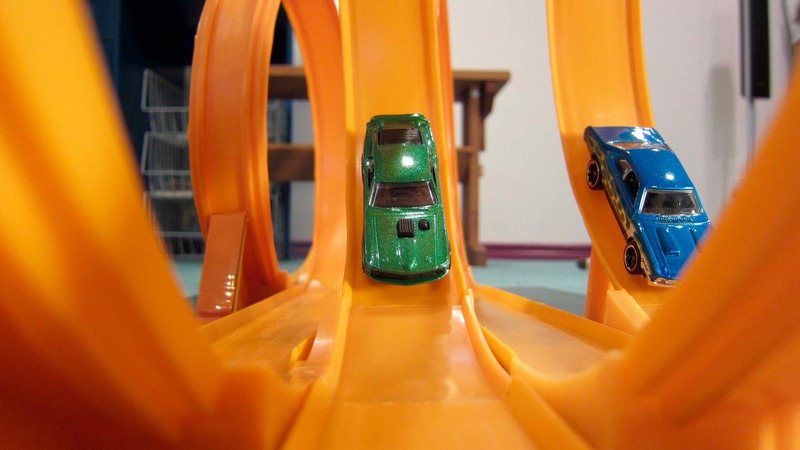 Today I am putting 6 Hot Wheels cars through their paces on “The Tricky 8” track. l to r: Aston Martin Vantage GT3, ’07 Shelby GT500, ’68 Mercury Cougar, Custom ’15 Ford Mustang, Corvette Grand Sport and Olds 442. So there you have it. 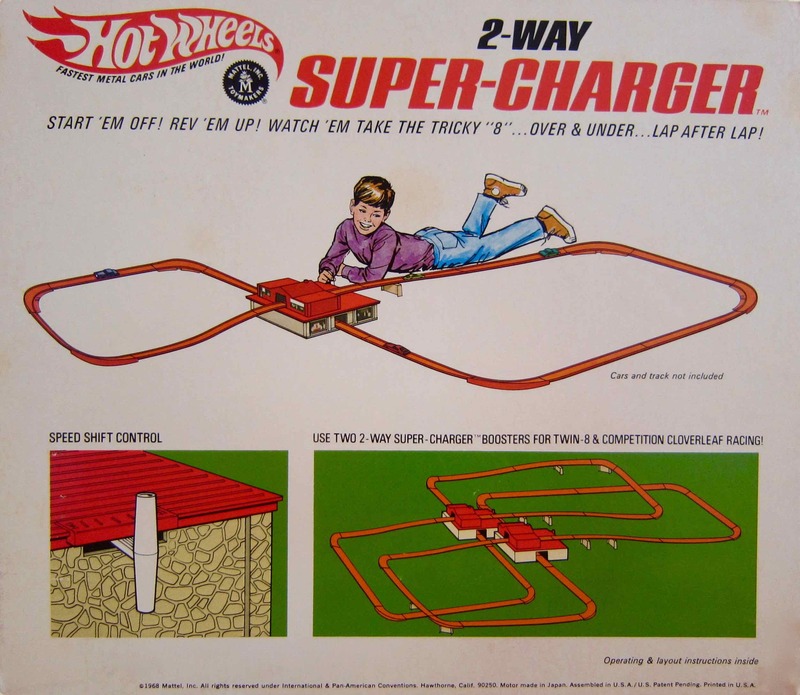 The 1969 Hot Wheels 2-Way Super-Charger driving the figure-8 layout. Back in 1969, if you had a bunch of orange track and you wanted to go drag racing, the easiest way to do it was to get the Competition Pak. 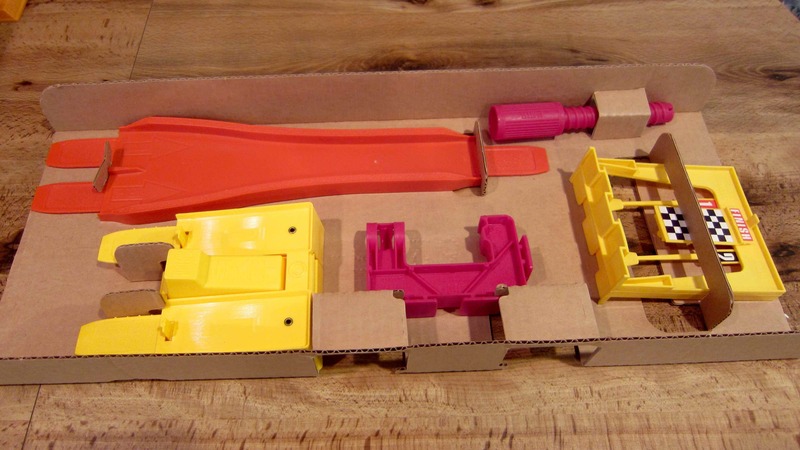 The Competition Pak comes with universal clamp, start gate, finish gate and elimination merger. With this drag set up I’m running 4 world cars. l to r: orange ’73 Ford Falcon XB, silver 1963 Aston Martin DB5, yellow ’74 Brazilian Dodge Charger and black Toyota 2000 GT. These 4 cars are from South America, Australia, Europe and Asia. The 1974 Brazilian Dodge Charger was actually a Dodge Dart with a modified Charger front clip and swept back roof pillars. But it came with a 318 cubic inch V8 and was considered “the fastest car in Brazil”. The Ford Falcon XB, built from 1973 to 1976, was a performance car made by Ford Australia. Under the hood was a 351 cubic inch V8. A modified version of the 1973 car was driven by Mel Gibson in the 1976 movie “Mad Max”. The Aston Martin DB5 was released in England during 1963. It came with a magnesium alloy body and an all aluminium engine. This car is famously featured in the 1964 James Bond movie “Goldfinger”. 351 Toyota 2000GT’s were built between 1967 and 1970. It was Japan’s first supercar and a convertible version was used in the 1967 James Bond movie “You Only Live Twice”. Enough about the cars…time to go racing. So there you have it. 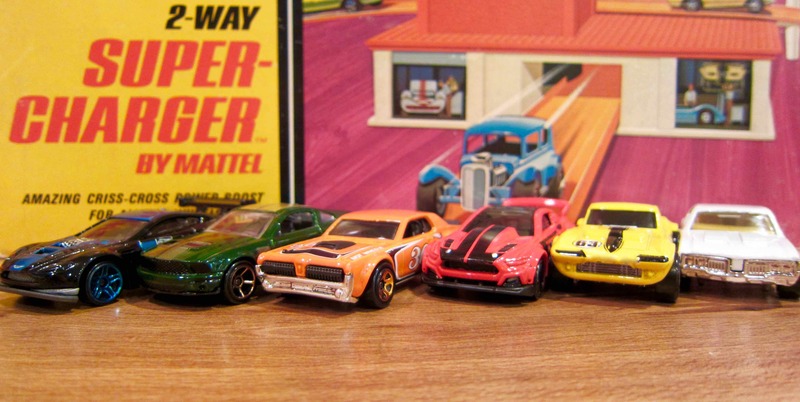 The Hot Wheels 1969 Competition Pak. 1969 Hot Wheels Collectors’ Catalogue. Copyright Mattel, Inc.
1969 Hot Wheels Collectors’ Catalogue. Close-up of Competition Pak. Copyright Mattel, Inc.